In the department store project, The data were obtained through in-home personal interviews, The supervisors edited the questionnaires as the interviewers turned them in, The questionnaires were checked for incomplete, inconsistent, and ambiguous responses. Questionnaires with unsatisfactory responses were returned to the field and the interviewers were asked to recontact the respondents 10 obtain the required information, Nine questionnaires were discarded because the proportion of unsatisfactory responses was large. This resulted in a final sample size of 271. A code book was developed for coding the questionnaires, Coding was relatively simple because there were no open-ended questions, The data were transcribed onto a computer tape via keypunching, About 25 percent of the data were verified for keypunching errors, The data were cleaned by identifying , out-of-range and logically inconsistent responses, Most of the rating information was obtained using 6-point scales, so responses of 0, 7, and 8 were considered out of range and a code of 9 was assigned 10 missing responses. Any missing responses were treated by case wise deletion, in which respondents with any missing values were dropped from the analysis. 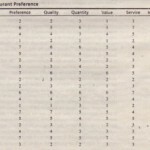 Case wise deletion was selected because the number of cases (respondents) with missing values was small and the sample size was sufficiently large. In statistically adjusting the data, dummy variables were created for the categorical variables. New variables re-composites of original variables were also created. For example the familiarity ratings of the 10 department stores were summed to create a familiarity index. Finally, a data analysis strategy was developed. 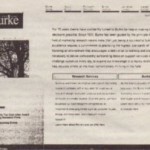 According to Damon Jones, Office Manager, Data Acquisition and Processing Burke Inc. completed questionnaires from the field often have many small errors because of the inconsistent quality of interviewing. For example qualifying responses are not circled or skip patterns are not followed accurately. These small errors can be costly. When responses from such questionnaires are put into a computer Burke runs a cleaning program that checks for completeness and logic, Discrepancies are identified and checked b) the tabulation supervisors, Once the errors are identified, appropriate corrective action is taken before data analysis is carried out. Burke has found that this procedure substantially increases the quality of statistical results. The department store example describes the various phases of the data-preparation process, Note that the process is initiated while the fieldwork is still in progress, The Burke example describes the importance of cleaning data and identifying and correcting errors before the data are analyzed, A systematic description of the data-preparation process follows.